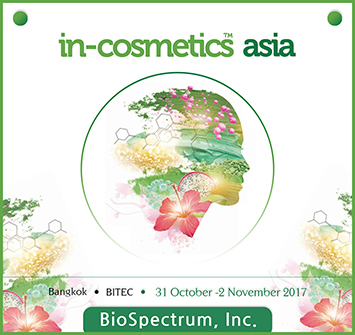 We gladly announce that BioSpectrum will attend in-cosmetics Asia 2017 in BITEC, Bangkok from Oct. 31st to Nov. 2nd. In this exhibition, we will share the booth with our strategic partner, Clariant. Please visit us and meet our superior active ingredients and the new ingredient for blue light protection which will be newly launched in this show! Please visit us and do not miss the chance to meet our new blue light and circadian rhythm protection ingredient! We look forward to seeing you in Bangkok!